"Homage to Hubble:I", 51" w x 40" h. Selected for Smithsonian Community Art Show, summer 2011. Cotton and other fabrics, pieced, couched and quilted. 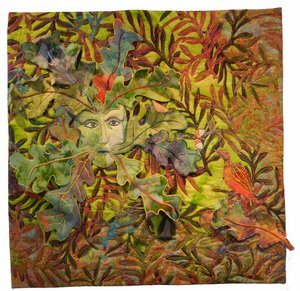 "Green Man 2013", 24" w x 24" h. A pre-Christian symbol of vegetative energy. Selected for Sacred Threads show in Washington, and subsequent shows around US. 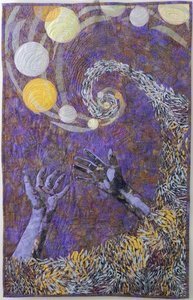 Transformations have long attracted and challenged me – first in my architectural work, now in quilting and fiber arts. I enjoy finding and expressing the possibilities in fabrics, letting the material find its voice. 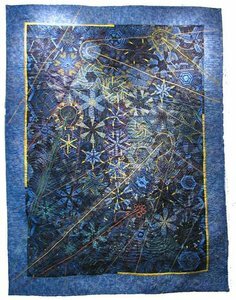 Traditional piecework leads me to improvisation and new expressions, including couching and other embellishments. 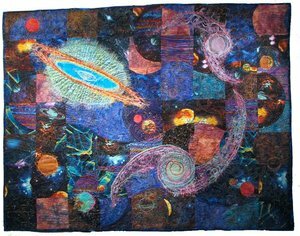 Most of my pieces are art quilts, though I also make bed quilts, table runners and other useful quilted objects. Each project brings its own challenges and delights. "Silver Apples of the Moon, Golden Apples of the Sun" 22" w x 38" h. Design based on a William Butler Yeats poem, "Song of Wandering Aengus" which soeaks to me of the search for one's lost, innocent self. 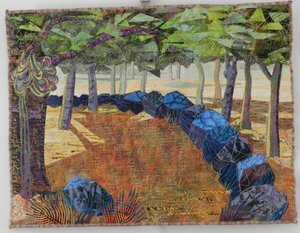 "The Blue Stone Wall, 20" w x 15" h. Fused applique landscape quilt, based on an early morning walk in the Turkish countryside. 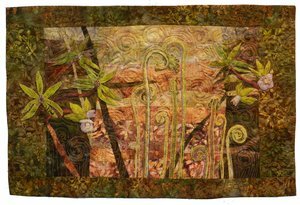 "Early Spring", 29" w x 20" h. A tribute to the ferns and hellebores which announce spring in my back yard.